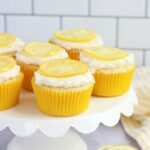 These Lemon Coconut cupcakes have a moist and light lemon cake, filled with lemon curd, and topped with a sweet coconut frosting. The perfect spring cupcake flavor. Citrus has always had a special place in my heart, but this recipe takes the cake! Or, er, cupcake. 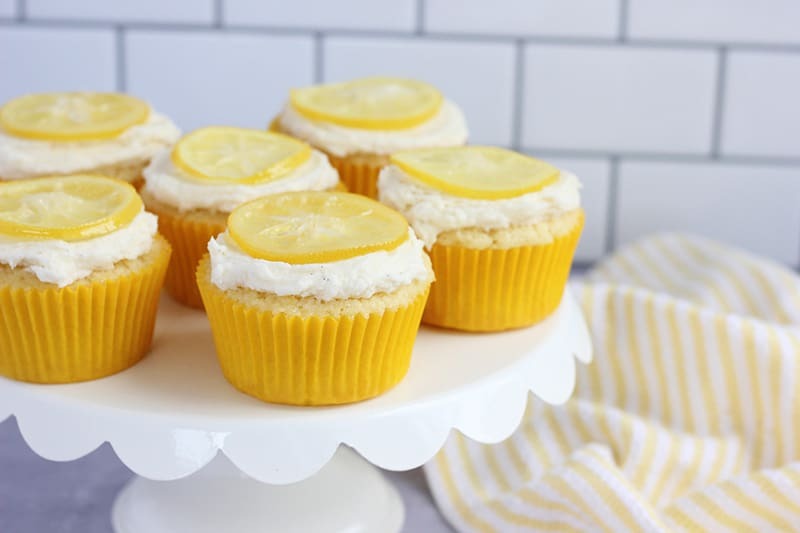 It is filled with bold lemon flavor and complimented by a sweet and silky coconut buttercream frosting. It is not even a stretch to say that we fought over the last one. My husband physically shoved me away from the plate and claimed the remaining small cake as his precious. It was weird, creepy, and one of the many many reasons I love that man. It’s also true. This cake is worth fighting for. The spring flavor combination is wonderful and even kid approved! My nine year old gives it five stars and two thumbs way up! Before I release you to bake these sweet bites of perfection, I want to leave you with a few tips. 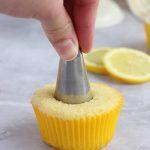 If you follow these cupcake baking suggestions you will be left with a super light and moist sponge like cake and smooth vanilla bean specked frosting! I always suggest starting with quality room temperature ingredients. When I say quality, what I mean is this… Use real vanilla extract, get a decent coconut milk (none of this reduced fat version), and fresh eggs. Making sure that the ingredients are at room temperature ensures that they will incorporate evenly giving you a smooth batter that is beautiful when baked. Mix it low and slow. While it may be tempting to turn the mixer speed up, try to keep it on the slower speeds. This will help keep just the right amount of air in your batter and produce that light and fluffy cake we are hoping for. Let them cool completely before you add filling and frosting. Do NOT refrigerate the cupcakes. This will pull all of the moisture from the cake and leave them dry. 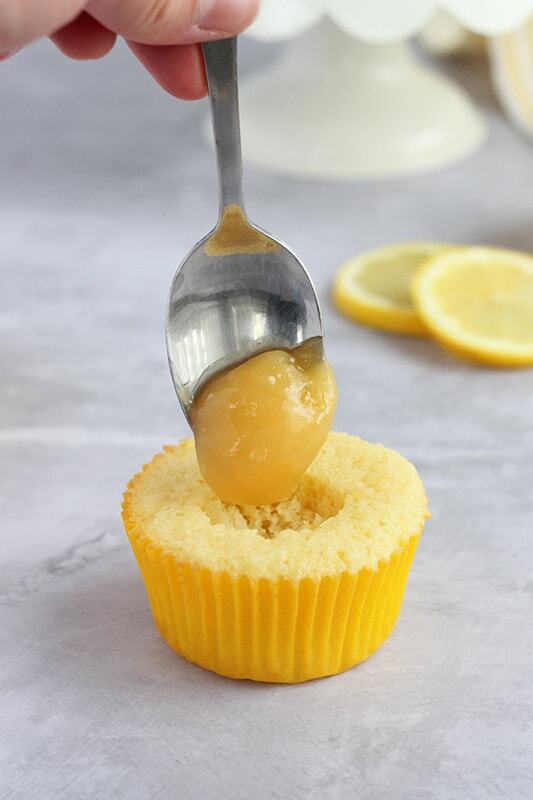 The lemon curd filling is what ties the cupcake and frosting together. DO NOT SKIP IT. 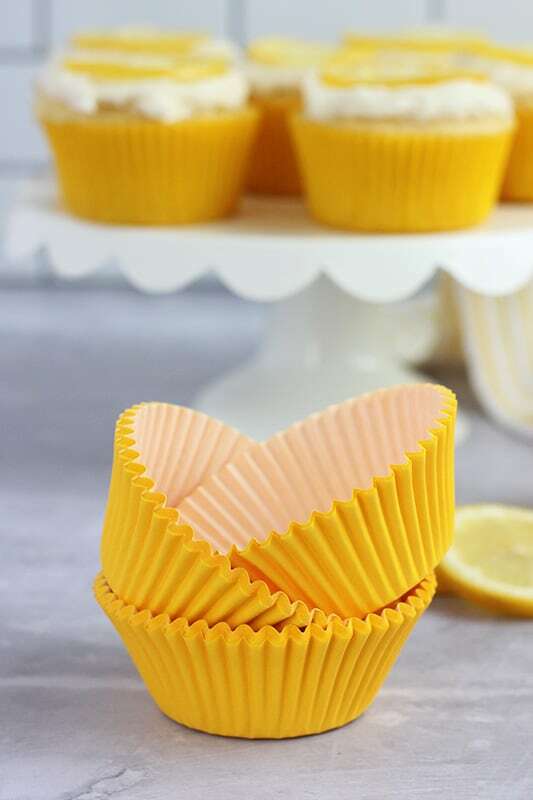 While it might sound intimidating, there is a quick and easy way to fill your cupcakes that will take less than five minutes! Twist back up and you should end up with the center of the cupcake pulling right out. Place the top back on and gently press down. For a full step by step tutorial with images visit this post. I found a store bought lemon curd but you could easily make your own. Either way you will love the end results of this lemon cake recipe! The star of the frosting is the coconut. I did not want to use an extract, which made it a little tricky to achieve a bold flavor. The fix? Reducing coconut milk to enhance the flavor! Place your coconut milk in a small pot. Lower the heat to a simmer and cook for 15-20 minutes or until the milk has reduced by half. Make sure you mix it throughout the process to avoid burning. Line one muffin tin with paper liners. Preheat the oven to 350 degrees. Whisk the flour, baking powder, and salt in a small measuring cup. Set aside. Combine the butter and sugar in the bowl of an electric mixer. Cream with the paddle attachment for 2-3 minutes or until fluffy. Add the eggs, one at a time. Stir in the vanilla extract, lemon zest, and lemon juice. Add the dry ingredients alternating with the coconut milk. Mix on low until fully incorporated. Divide the batter between the 12 prepared cupcake liners, about 3/4 full. Bake 15-17 minutes or until a toothpick comes out clean. 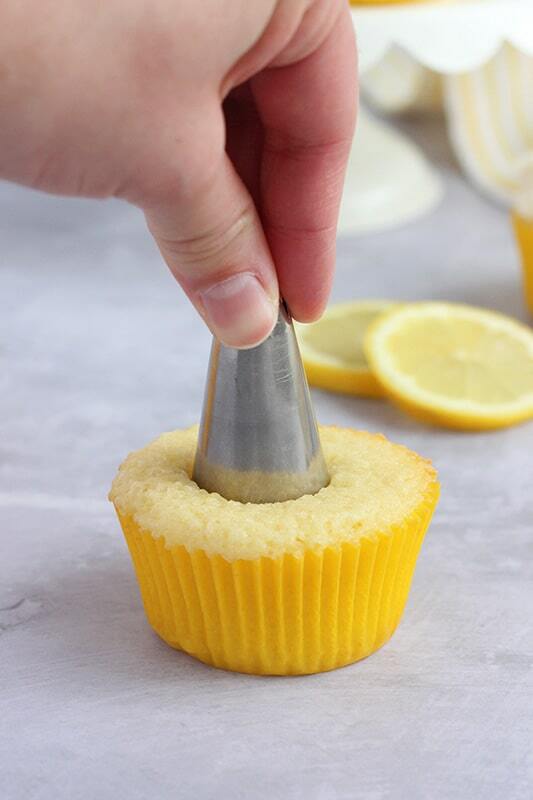 Remove the middle of your cupcake using a pairing knife or back of a piping tip. Fill with 1-2 teaspoons of lemon curd. Replace the removed cupcake middle and gently press down. Pour the coconut milk into a medium sized pot. Heat to a boil. Reduce to low heat. Cook for about 25-30 minutes, or until your milk has reduced to about half. Place in the refrigerator to cool. Cream together the butter and powdered sugar in the bowl of an electric mixer using the whisk attachment. Scrape the vanilla bean, or add the vanilla extract along with the reduced coconut milk. Whip until your desired consistency has formed. Ohhh! This look so refreshing! I love lemon and coconut but I’ve never had a treat that combined the two flavors. I’ve also been wanting to try something with the Meyer Lemon Curd I keep seeing at the grocery! Can’t wait to try these! Hi! 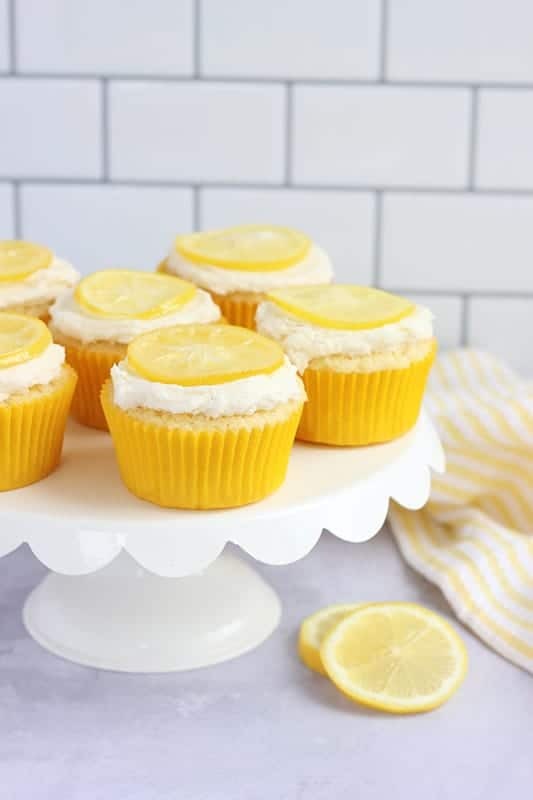 These look delish and I’m planning to make for a co-worker’s b-day…just wondering how many regular sized cupcakes this recipe makes? Thanks! Just tried these and they were delish, even though I just tried them in cupcake form without icing or custard *no time >.<*! Only thing I would suggest is adding a bit more milk to the cupcake mixture so it won't be as thick. Also added a little bit more lemon juice than suggested and found that even with a little bit more it would have been perfect! Turning it from a subtle just a hint of lemon to a bit more apparent but not garish zest. So yes recommendations for next time: not as thick and more lemon juice/zest! They were great!! Thanks for the fabulous recipe 😀 Now to try it with custard and coconut icing!! Yum!